1. Copyright; Limitations on Use. The entire contents of the document are copyrighted by The Freedonia Group, Inc. ("Freedonia"). Unauthorized reproduction or distribution of the publication, or any portion of it, may result in severe civil and criminal penalties, and will be prosecuted to the maximum extent necessary to protect the rights of Freedonia. 2. Rights to Copy and Distribute. Use of the document is limited to the individual purchasing this electronic use license. If other authorized users are indicated on the purchase option in connection with the purchase of this electronic use license, then the purchaser of this license may transmit electronic copies of the document to the number of additional authorized users reflected on the purchase option, provided that such individuals are also employees of the organization ("Licensee") which employs the purchasing individual. Except as noted in the preceding sentence, reproduction of the document in print, electronic, or other form, and the transmittal of the document in any form, are strictly prohibited. 3. Inclusion of Content in Other Works. On an occasional basis, limited portions of the document may be included in written memoranda, reports and presentations prepared by authorized users, but only if such memoranda, reports and presentations are distributed or otherwise made available to a limited number of Licensee's employees for internal use, and provided that Freedonia is cited as the source of the incorporated material. In no event shall any content be made available to any third party. 4. Protection from Unauthorized Use. The purchasing individual shall use reasonable efforts to inform authorized users of the content of the restrictions on use thereof. By clicking the "I Agree" button, the individual purchasing this Electronic Use License agrees to the foregoing terms and conditions. This study will present data for 2007, 2012, 2017 and forecasted data for 2022. 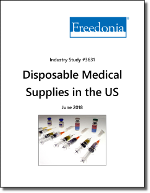 Coverage includes disposable medical supply products and markets, as well as evaluating overall healthcare trends. Based on the nature of patient care, hospitals will remain the largest and most diverse market for disposable medical supplies, providing opportunities in all product groups and accounting for nearly half of total product demand in 2022. Additionally, the ongoing threat of healthcare-associated infections in surgery and other patient procedures will boost demand for several additional types of disposable medical supplies. Read on to discover more disposable healthcare insights. Add This Study To Your Cart.